This looks like a setup. 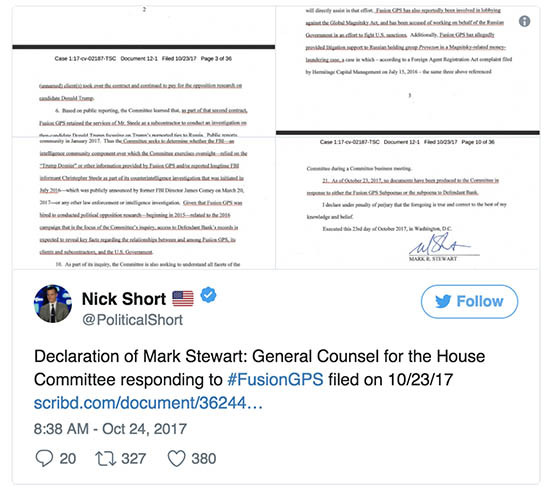 The GatewayPundit is reporting DNC-paid dossier producer Fusion GPS employees may have set up Donald Trump Jr. and the Trump campaign to hold a meeting in Trump Tower. From the court document: At least three of the individuals who attended a meeting with Donald Trump, Jr. at Trump Tower on June 9, 2016 – Soviet counterintelligence officer Rinat Akhmetshin, Russian lawyer Natalia Veselnitskaya, and Russian-born interperter Anatoloy Samochornov – also have ties to Fusion GPS dating to at least 2015.